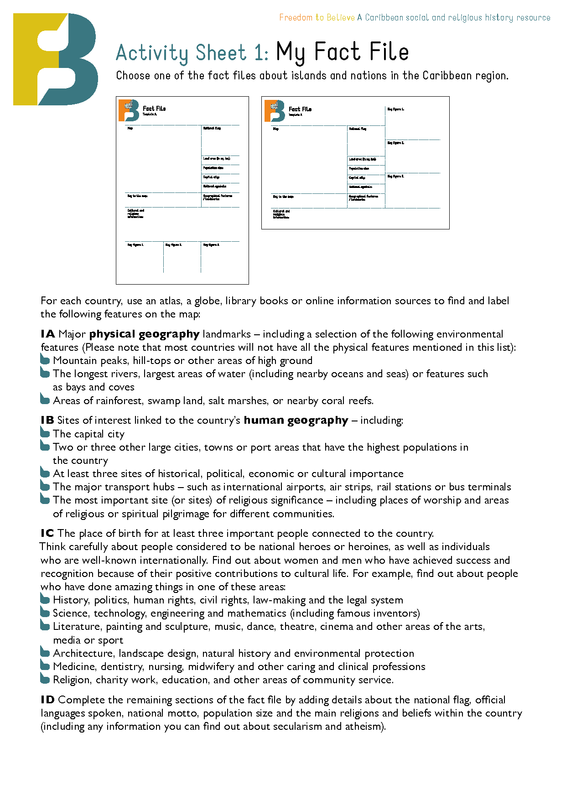 Choose one of the fact files about islands and nations in the Caribbean region. • Areas of rainforest, swamp land, salt marshes, or nearby coral reefs. • The most important site (or sites) of religious significance – including places of worship and areas of religious or spiritual pilgrimage for different communities. 1C The place of birth for at least three important people connected to the country. • Religion, charity work, education, and other areas of community service. 1D Complete the remaining sections of the fact file by adding details about the national flag, official languages spoken, national motto, population size and the main religions and beliefs within the country (including any information you can find out about secularism and atheism).